SALE Starting at $349 More Finishes. Same Price. SALE Starting at $399 More Finishes. Same Price. Handcrafted from solid wood frame, we’ve got the perfect wood dining room chairs for any occasion or decor. Enjoy those family gatherings just a little bit more as you experience the ideal blend of beauty and comfort that only Bassett delivers. Choose from one of our gorgeous dining room chair styles or take advantage of our custom design program to create your very own unique, one of a kind wood dining chairs. The choice is yours. Book an appointment with one of our professional design consultants and start creating your next family heirloom, your piece de resistance, today! At Bassett, we are, above all, craftsmen. We pride ourselves in a job well done – and beautifully completed to meet or exceed your expectations. Through our Bench*Made program, we bring you the very best in design and solid construction. 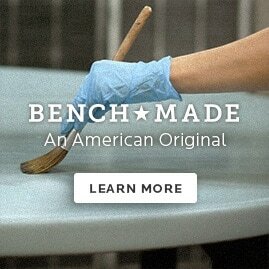 Hand finishes by our artisan furniture makers, every Bench*Made dining room chair is made one piece at a time without ever touching an assembly line. Each and every wood chair is made with uncompromising care and attention to detail. The beautiful, solid red leaf maple and oak used to make these chairs and tables is harvested exclusively from the Appalachian region in the US. Two new trees are planted for every dining table we sell. And when we do source materials globally, we make sure we work with only trusted partners who share our values and ideals of high quality and superb craftsmanship. Go to a Bassett furniture showroom near you and have a look at our latest in wood dining chairs. Become inspired by cutting edge design from around the world. Then, once you’re ready, let’s get together and build your next family heirloom.